A highly efficient way to water hanging baskets, flower pots, window planters and certain types of planting beds. When properly designed and installed, drip irrigation can be very water efficient. Several different styles exist however, with it being a type of sub surface watering system the shallow piping can make it somewhat impractical in planting beds that are routinely cultivated. Best when used in mulch beds that remain normally undisturbed or for hanging baskets, narrow strips or isolated planted boxes. 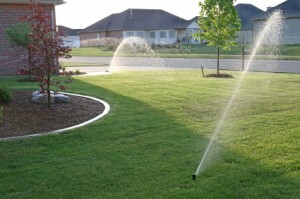 Bate and Reece Lawn Sprinklers servicing and installing sprinkler systems throughout metro-Detroit.